To use the audio system function, the ignition switch must be in ACCESSORY (q or ON (w*1. Select to display available options including Sound, View Radio Text, Music Search, and playback modes. : Select to go back to the previous screen when the icon is illuminated. Press once and select - or + to make an adjustment. 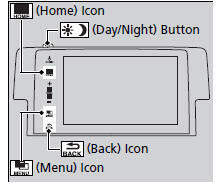 Each time you press , the mode switches between daytime, nighttime and off.